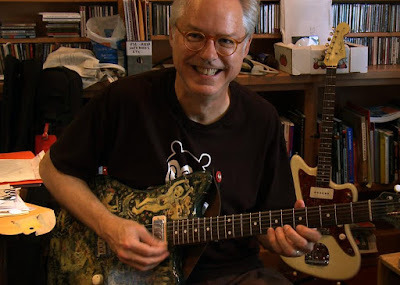 Tomorrow BILL FRISELL: A PORTRAIT opens in NYC's IFC Center. Mr Frisell and director Emma Franz will be there for several screenings (see below). In order to get you to go I present a slightly altered version of the review I ran at DOC NYC modified because time and thought have changed my feelings toward the film. BILL FRISELL: A PORTRAIT is an excellent look at the man and his music. Filled with discussions of Frisell and the people he's worked with and influenced (that's pretty much everyone) and mixed with tons of music the film pretty much lets you know everything you want to know about the man.We hear stories about his working with everyone in every type of music as we hear the music that they made together. Its a wonderful celebration of the man and his life. This is a super film, but this can be a little long at times since there is a bit of repetition of points and an occasional too leisurely pace. On the other hand and more importantly sequences such as the opening one with artist Jim Woodring where they talk about how some things such as art and music being beyond words are stunning and then there is the music which is just magical. It is the fact that the individual sequences and the music have hung with me for the last month that has forced me to go back and rewrite this review. Wed 6th & Thurs 7th Dec are 1.35pm, 4.05pm, 6.45pm, 9.25pm.